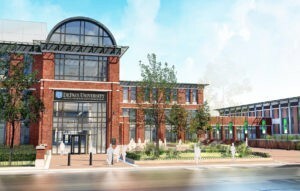 DePaul University’s new School of Music building will be named for its outgoing president, the Rev. Dennis H. Holtschneider, C.M., who served in the role for 13 years. The Holtschneider Center for Music and Performance is slated to open in spring of 2018 on the Lincoln Park Campus. DePaul’s board of trustees also named Holtschneider as the university’s next chancellor. The Rev. Dennis H. Holtschneider, C.M., has served as DePaul’s president since 2004 and announced his decision to step down in June 2016. The board has named Holtschneider as the university’s next chancellor. Click here for more information on The Holtschneider Center for Music and Performance. In the mood for some music? Join the DePaul University School of Music for Neighbor’s Night with a special pre-show reception and then an evening of jazz. Admission is free but an RSVP is required for the pre-show event. Click here for more information.